Very few of my Nick Swisher baseball cards have been picked up at card shows — it’s like finding a needle in a haystack if you’re looking for looking for rarer cards like this 2011 Topps Gypsy Queen Stamp card. Only 10 copies exist, and when I spotted one by complete accident in a dealer’s case recently at a show in Arlington, Texas, it had a $30 pricetag on it. That’s quite high for my Swisher Buying Standards™ — but I was with someone who knew the dealer and asked him whether he’d cut me a deal. Peer pressure got me a bit of a discount, but not much. I thought I overpaid but I knew that none of the other nine copies had shown up on eBay in a couple weeks of collecors ripping GQ. I figured I’d never see one again. As it turns out, I didn’t overpay at all as the first copy to arrive on eBay went for $66 — well beyond what I paid. Gotta love those deep-pocketed Yankees fans. 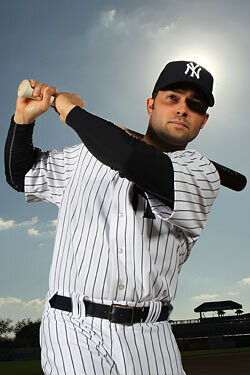 I’m not the first owner of this Nick Swisher card, but I intend to be the last one. But It eventually found its way to me when the collector decided to part with most of the Swishes in his stash, selling at a loss, and now it’s mine. It’s not without some minor flaws — a sticker auto with the ink running off and the crooked authentication sticker — but it’s my priciest Swish. It’s a 1/1 card that also has a Logoman and autograph of Rich Harden, another former A’s player, on the back. Topps has produced more than a few Nick Swisher game-used baseball bat cards since the first one arrived in 2004 Bowman Draft, but Swish has just two bat knob cards made by any card company. Each is a 1/1 autographed knob card found in 2009 Topps Unique, a one-shot product that had some high-end thrills found inside its packs. The two knob cards in Unique have different card numbers — and I am not sure whether one that I lost on eBay is the other card or whether I won this one during its second time on the block. Neither card had much distinguishing features on the knob, unlike most Swisher gamers, which typically have had “BLS” (Swisher’s grandmother’s initials) or some other message on them. Nick Swisher’s first MLB cards arrived in the 2002 Bowman Draft Picks & Prospects product and the best card to land in that one is his Gold Refractor. Limited to just 50 serial-numbered copies, this unsigned Rookie Card may not seem so special these days — where all of the rare versions come with actual autographs — but it’s the best one. Unfortunately, I own only 1/25th of the entire press run … I need more! You can see each version after the jump. My first Nick Swisher autograph was this one, which was in the 2004 USA Baseball 25th Anniversary set. I found the card in a set I bought at a hobby shop called What’s on Second in San Antonio, Texas. While it came out two years after his first Bowman cards, it was his first certified autograph ever made. The card also came in black-, red- and green-ink versions. I own them all except for the green — only two of those exist. You can see all three versions of the card that I have after the jump. Here is where, from time to time, I will post images and brief descriptions of the Nick Swisher cards and memorabilia in my collection. Over time, my goal to have everything in the stash documented right here.